Having recently reviewed the latest themed compilation release from Swedish based label Hemifran, comparisons were always inevitable when presented with an immediate opportunity to check out one of their previous collections from last year. Whereas their latest release took a few listens to appreciate the depth and quality of some of the recordings, there was no such delay with grasping the artistic merits of this album, the second of a two-part series based around the concept of the ‘home’. This was probably due to the down to earth country sound of a majority of the tracks which was more in tune with the album’s theme rather than the inner deep thoughts surrounding the follow up collection of secular hymns. As synonymous with their other compilations, well respected artists from America share the platform with their European counterparts and it’s a credit to the latter that the quality is seamless throughout the album. 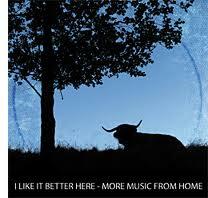 Also, in line with other Hemifran collections, ‘I Like It Better Here – More Music From Home’, to give the album its full title, allows the artists the opportunity to offer the listener, via the sleeve notes, a little background to their choice of song and this adds to the experience of exploring the stories behind these eighteen tracks. Thus we learn about the home coming vision that Fayssoux experienced in her song ‘Golightly Creek’, a number co-written with East Nashville’s finest Eric Brace and Peter Cooper, as well as the inspiration Annie Keating drew from the ‘Water Tower View’, the title and subject of her contribution written in the early days of settling in New York City. The quality of any album is always going to be enhanced with the inclusion of a Kimmie Rhodes track and she doesn’t disappoint with her number ‘I Just Drove By’ especially as she took several years to perfect a song that was instrumental in opening many doors for her. A couple of other U.S. contributions that warrant further artist interest are ‘Calling Me Home’ by Austin based duo Christine Albert and Chris Gage, while the much travelled pairing of Fur Dixon and Steve Werner light up the early stages of this album with ‘Little Paradise’. The European take on this record begins with a transatlantic collaboration where West Coast song writing veteran Jack Tempchin, of Eagles ‘Peaceful Easy Feeling’ fame, provides one of his songs – ‘You Only Live Once’ – for Swedish artist Citizen K to record under the tribute name, Smashing Tempchins. Slowhand and Little Green also supply more home grown input for the Scandinavian hosts with their fine interpretations of Americana music while Britain is represented by Dean Owens’ upbeat feel good catchy number simply titled ‘Good’ and the bluesy contribution ‘Welcome Home’ from Hey Negrita. There is a mysterious ending to the album with a prolonged silence after the listed final song ‘When I Go’ by Henrik af Ugglass followed by an encore-like treat of one decent unannounced track before a rather out of context rap-like mix to bring the album to its conclusion. With this release, Hemifran continue to do a grand job of showcasing and promoting some serious talent that warrants further exposure especially in the UK and this album goes some way to raising the profile of this music. All that’s needed now is to continue to back trawl through the Hemifran collection and see if their previous compilations match up to the high standards of this excellent well recommended album.